Now here’s a new concept: Visually represent the Web against a map of Antarctica. It sounds strange, and it surely is ambitious, but check out Map.net and see what you think. Oh, and it only supports IE 5.x browsers. The goal is to become the largest human-edited directory on the Web. It’s called Antarcti.ca™ (cute name alert), and it’s the brainchild of XML co-creator Tim Bray. It’s ironic that the project currently only supports Microsoft browsers, since the basic data comes from Netscape/AOL’s Open Directory Project (http://dmoz.org ). Each of the 300,000 categories includes chat capability as well. The site is free. So what’s the business model? Seems that the company expects to make money doing custom maps of corporate networks. Kinda like the old Netscape model . . .
Here’s a weird use of technology. MusicBooth’s AdAcoustics® ad insertion technology enables advertisers to deliver targeted, one-to-one audio messages to online radio listeners, without requiring a download or registration. AdAcoustics removes broadcast ads from its partners’ streaming content and seamlessly replaces the advertisement with personalized messages. To do this, it uses database of over 80 million anonymous profiles to select the right ad. They plan on going wireless, using partner Interep, as well. Listeners can immediately respond to an advertiser’s message using another MusicBooth tool, I-fetch (all these I- products make me I-retch). Well, it sounds like a cool idea, but I worry a little about the “80 million anonymous profiles” database. It sounds a little like what Angara does. They have a database of more than 100 million anonymous profiles. Partners of this network include Engage, MatchLogic, Naviant, and Persona. As long as this information is truly anonymous, then I guess it’s OK. But what if it isn’t? This effort is stemming from HP’s “CoolTown” research project. Let’s see. Our image is stodgy; we don’t seem to get it. I know! Let’s start a project called “CoolTown!” Then all the kids will think we’re hep! Kidding aside, HP envisions, in CoolTown, that devices will be broadcasting URLs wirelessly throughout our environment via “beacons.” This sounds like Bluetooth, but HP doesn’t name that technology specifically. HP is also a partner in MIT’s Oxygen project, which aims to bring a pervasive computing fabric to everyday life. I do like one turn of phrase in HP’s CoolTown propaganda, though: “your pocket device becomes a remote control for the world-at-large.” Yes! Now I can mute the people who talk in movies! UDDI is a non-profit organization originally established by Ariba, IBM, and Microsoft that is fostering a Universal Description, Discovery, and Integration standard. This standard will involve “the creation of a service registry architecture that presents a standard way for businesses to build a registry, query other businesses, and enable those registered businesses to interoperate and share information globally in a distributed manner.” This registry will contain information on how each business is able to do electronic commerce and provides a globally unique identifier. The goal is to help businesses find trading partners and enter into productive relationships without worrying about disparate technologies. “Registering with UDDI will enable a company to publicly list a definition of itself, its services, and methods for engagement.” The list of community members includes most of the luminaries of the B2B marketplace. The real test will be in spreading the concept into the rest of the industrial marketplaces. EMarketer has released a survey that ranks the most popular ASP applications. To no one’s surprise email was number one. E-commerce, however, was second followed by accounting/financial. I guess I’m not surprised about e-commerce, but accounting/financial? Very interesting. The big stat in this article is: “The Kelsey Group predicts that speech portals will be reaping more than $5 billion in revenue from advertising, ecommerce transactions, and subscriber fees by 2005.” The big bummer is, the business model for voice is not yet clear, and it’s not at all a sure thing that consumers will accept advertising. The Japanese have the coolest phones. Take a look at the latest from Sharp for the Japanese market. 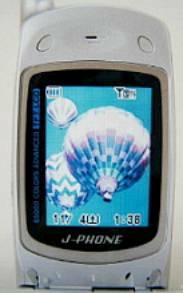 "J-SH05" has a TFT liquid crystal panel, which can be folded into the size of a palm. The screen is 2-inch in size, displays 65,536 colors, and displays up to 10 words x 12 lines. Sprint and Samsung have released a phone with a built-in MP3 player and access to music downloading sites. Sprint PCS My Music service is supplied and managed by HitHive and incorporates RealNetworks RealJukebox software. The phone is the new Samsung Uproar. Apparently, users must rip and upload MP3s from their own music collections for later download to the phone. What’s wrong with this picture? Wouldn’t a Rio be handier? But I guess the pocket bulk factor is important too. The cool thing is you can stream the music directly to the phone. And the phone has 64MB of memory for more than an hour of playback time. Gateway-AOL: You’ve got Net appliance! Anyway, unlike Netpliance, which is getting out of the consumer market, Gateway and AOL obviously don’t think the Net Appliance market is dead. But tell me: Who wants a $600 appliance? Get an eMachine! However, this announcement is also notable because it involves Transmeta chips. Transmeta is the company that persuaded the creator of Linux, Linus Torvalds, to come work for them. So where have I been? Swatch invented Internet time two years ago! Oh, darn. One small problem: the phrase Internet Time® is trademarked in the US by VirtualFund. Is the Web a Good ASP Platform? Here’s a good way to get some publicity: Do what the new ASP named 7 (stupid name alert) did. Challenge the assumption that the Web can provide decent quality of service and be reliable enough for application delivery. Instead, 7 will run leased lines to the businesses it serves. The UK ASP launched this week. Naturally, other ASPs are up in arms, but Sun more or less agreed that some apps can be delivered reliably over the Web. A poll of European IT directors by Rhetorik found that 70 percent were concerned about security, and more than half worried about reliability of ASP applications. It’s an interesting debate, and one we’ll hear more about as more and more companies move their businesses to the Web. Drudgereport.com, MSNBC.com, and Voter.com all had problems handling the volume as voters flocked to the Web for the latest news. There were similar problems four years ago, and the sites had vowed they’d handle it this time. Who does Microsoft turn to when they want to run their business application? AS/400. This is such poetic justice. Dr. Frank Soltis, the IBM engineer who has been called "the AS/400’s Elvis," (you know, fat, puffy, drug-addicted – I guess that’s what they mean) related the story of a software company that turned in their 23 AS/400s and fired up 1,200 NT machines to replace them. Now that company is back on AS/400, having despaired of getting the NT solution to work. The company? Microsoft. It’s just too good to be true. Secure Music Delivery On the Way? The Secure Digital Music Initiative (SDMI) issued a $60,000 challenge to hackers to try to break six proposed security schemes for secure digital music delivery. The group claims that three of the technologies survived the challenge, while two of the other three were hacked successfully. SDMI did not reveal the identities of the successful schemes, but San Diego, Calif.-based Verance Corp. claimed its watermarking technology was one of the challenge survivors. And Princeton University and Xerox’s Palo Alto Research Center (PARC) claim to have defeated the four technologies using digital watermarking, contrary to SDMI’s claim. The Princeton/PARC group claims SDMI is using a technicality, the fact that the group reserved the right to publish their results and thus were ineligible for the prize, to avoid acknowledging their success. This article by Dan Briody is alarming in a couple of ways. First, he details plans to bombard us with ads on our wireless phones (analysts predict a $750 million wireless advertising market by 2005), and he allows that he’d welcome them if they’d knock $20 off his phone bill. But even more alarming is his tale of visiting the restroom at a tony New York restaurant only to be assaulted by an audio ad featuring Norm MacDonald. Truly terrifying: Are we not to be given a moment’s peace? Even more depressing is the news of a European study that found that users are receptive to the idea of wireless ads. Of course, the study was done on behalf of cell phone vendor Ericsson, but 40 percent of 5,000 Swedish subjects found the advertising compelling, and 20 percent wanted more information after viewing the ads. Hear the wave. InternetSpeech introduced its NetEcho service that will read you Web pages over your phone. Now we’re getting somewhere. This service promises to trump more limited offerings like TellMet. The flip side often reflects an optimism bordering on naiveté. Many people still recall predictions in the 1950s that the world would enjoy nuclear power “too cheap to meter.” Or that we would fly personal jets to work and return from 20-hour workweeks to smart homes and robot servants that would prepare dinner automatically. So the computer on your desk is the equivalent of a million of the room-filling behemoths of the early ‘50s. Who knows what tomorrow will bring?